A larger portrait on a small coin. The Indian Gold Dollar (Type 3) ranges from 1856 to 1889. It represents the third type of this denomination produced by the U.S. Mint. 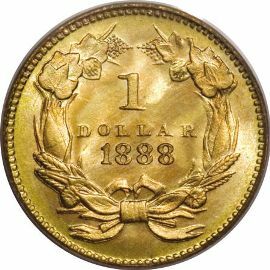 These coins are very similar to three dollar gold pieces in that both the obverse and reverse designs are the same. 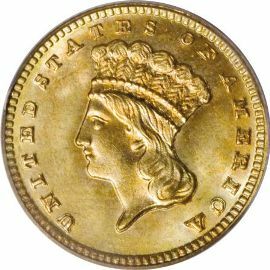 These type three dollars are Longacres attempt to correct the high relief design of the type two coins. It is much easier to find fully struck coins during this date range rather than the earlier. Princess". The portrait is surrounded by the inscription "UNITED STATES OF AMERICA". The reverse of this coin is the same as its predecessor. It has the denomination of 1 DOLLAR with the date below it. This design is surrounded by a wreath of corn, cotton, wheat and tobacco.